I love the precious tea spoon and I'm happy you kept it. The shamrock teacup and saucer is gorgeous. Love your teacup and saucer! I have never seen that pattern. So perfect for St. Patty's Day. What a unique tea spoon. I'm also admiring your charming Aynsley shamrock tea set. What a lucky find! Your shamrocks tea cup is just gorgeous! I know you are happy to have it. There aren't nearly as many things to collect for St. Patrick's Day. Hugs! Betty your Aynsley shamrock teacup and saucer are perfect for the season and St Patrick's Day celebrations. Mu Nana used to have a tea spoon similar to yours as I recall and is a lovely nostalgic touch to your setting. So good to have your company @ MM again this week. Such a delicate teacup and saucer ... my husband would appreciate your sensibility to fine tea brewed the proper way! That's a beautiful tea cup and perfect for St. Patrick's day. So pretty. What a sweet tea vignette, Betty! I do love your daffodils and the tea spoon is precious. Happy St. Patrick's Day! 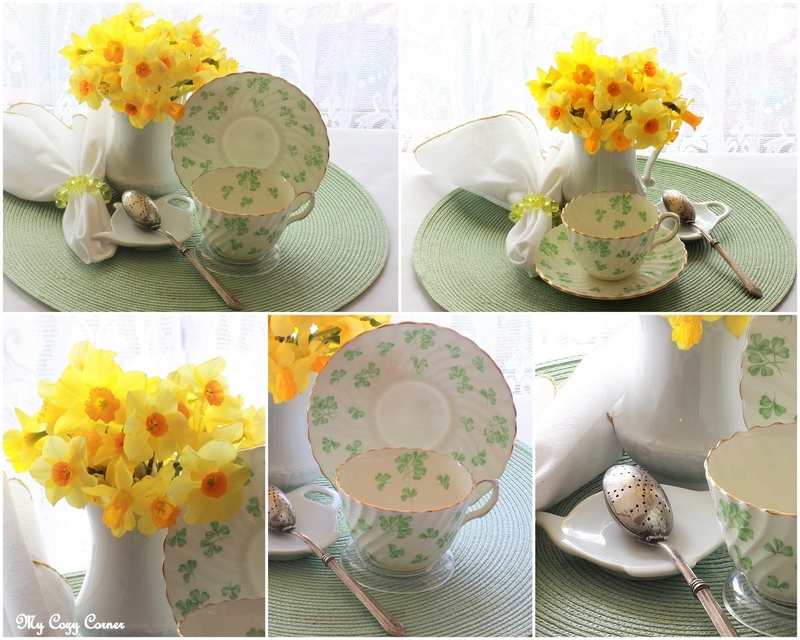 Love your new teacup and the beautiful bouquet of daffodils too! Betty, that Aynsley pattern would be beautiful throughout springtime! Daffodils are perfect for the tea table. I am loving your springtime daffodils as we are all so ready for spring. Your cup and saucer was a great find and will be perfect for this special time of year. Thanks for sharing and linking! Hello Betty~ Such a lovely place you have here and I'm happily following along with you. Your grandmother's tea set is gorgeous! I took some time and read some of your older posts, just lovely. Betty I am dancing an Irish jig over this post. Your sweet shamrock china is a delight.